No. 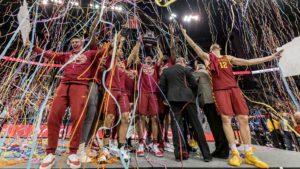 5 Iowa State (23-11, 9-9 Big 12) won the 2019 Big 12 Championship with a 78-66 victory over No. 3 Kansas (25-9, 12-6 Big 12). It is the fourth time in the last six years that the Cyclones have won the conference tournament title. Seeded fifth, the Cyclones are the lowest seeded team to ever win the Big 12 Tournament. Following the conclusion of the game, the Big 12 named its 2019 Big 12 All-Tournament Team. Marial Shayok was named the Most Outstanding Player for the tournament. Lindell Wigginton and Michael Jacobson were also name to the 2019 Big 12 All-Tournament Team. The Cyclones were in complete control of the contest. Iowa State held a lead for over 36 minutes of the championship game. The Cyclones raced out to a 10-point lead to close out the first half. The Cardinal and Gold led by as many as 17 in the second half and never let the Jayhawks back to within nine points of the lead. ISU’s second-half shooting performance was a huge part in maintaining the lead. The Cyclones hit on 13-23 attempts in the second half and 4-8 from deep. Iowa State set the tone early in the game, taking an early lead to begin the game. Following the under eight-minute timeout, the Jayhawks erased the Cyclones’ lead, tying the game at 21-21. That would be the last time ISU did not have a lead in the game. The Cyclones then finished the half on an 11-1 run in which they held KU to no field goals in the final 6:34 of the first half and brought a 32-22 lead into the locker room with them. Like the first two games in Kansas City, the Cyclones defense was on display. In the first half, Iowa State held Kansas to just 10-36 shooting, including 0-9 from deep. The Jayhawks did not do themselves any favors either, turning the ball over seven times and hitting just 2-8 free throw attempts in the first half.